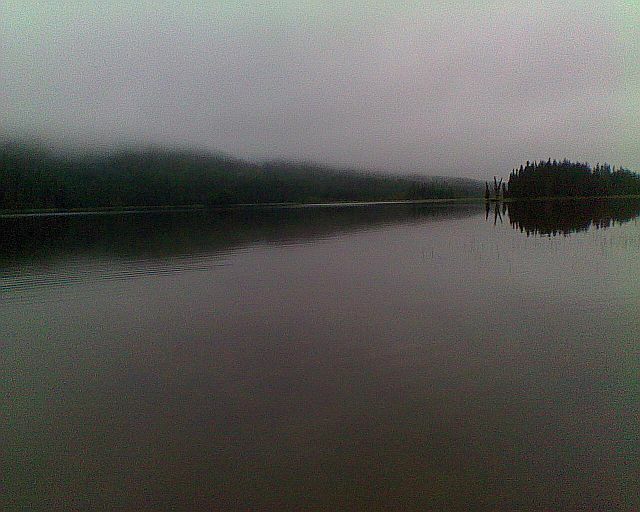 July10th to the 16th 2011, William A Switzer Prov Park, Gregg LakeAlberta. The theme was Back to our Roots. And I did pack the camerafirst this time!! This time Laura and I were able to be there for thewhole week and this time we did things different. 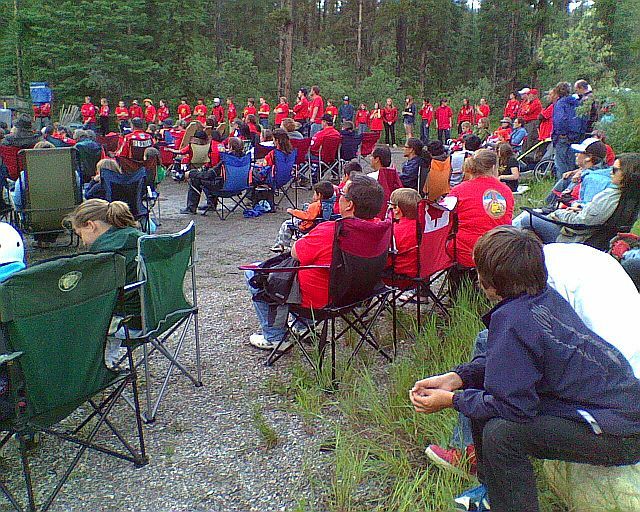 We packed along abunch of Jackfish Lures and a weeks worth of programs like the. Pike& Walleye on Spinnerbaits, Lake Classification & Ecology,Fishing Equipment Rods Reels Tackle boxes. Catch & ReleaseTechniques, Fishing Safety & Situational Awareness. Also FlyFishing and Fly Tying were included for the very first time and allwith a different approach to the style in which Laura & Ipresented each program. 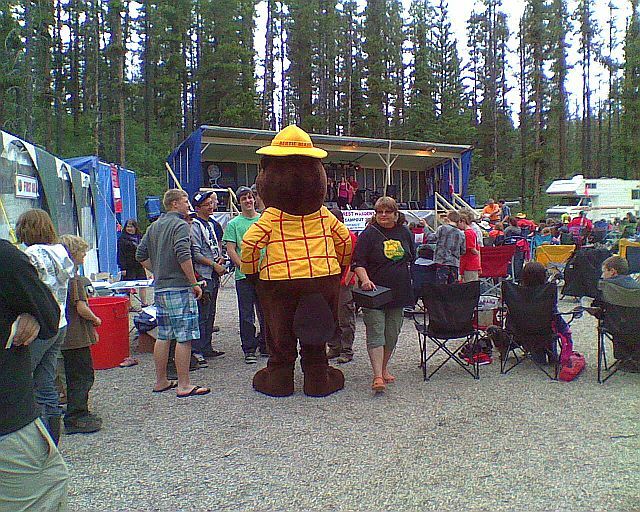 At the 2011 Junior Forest Warden NationalCampout at Gregg Lake Alberta. 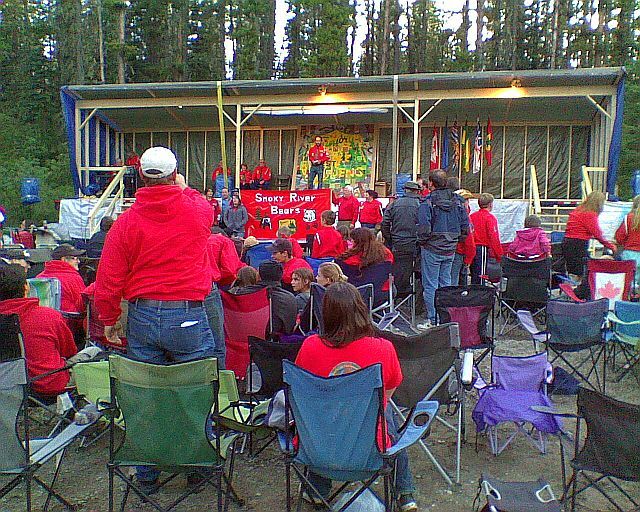 Opening ceremonies of the 2011 National campout. Lauraand I had never seen an opening ceremony before so we were intriguedto say the least and decided to show up for the opening. First of allI could not believe the number of people who drove and flew in fromall over Canada to this event I am not official with this number butI think at least 1000 people showed up. You can see from the photosCamp Central was packed and the amazing part is not all had arrivedyet. They introduced the Committees and leaders and National CampoutChairperson Al Wardale got up and had the instructors come up frontto receive a cool instructors pin. 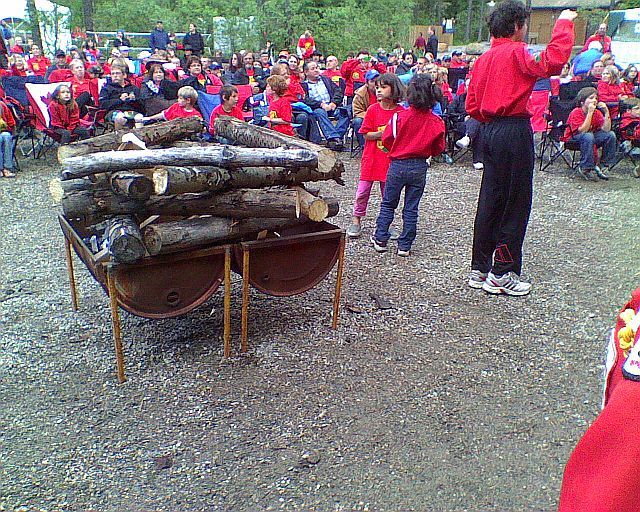 And then the clubs all marched tothe front and had a torch lit to start the fire to open the camp up.What was very interesting is they had ash from the 2008 National Campthat they put in before they lit the 2011 fire. The opening was veryvery nice and we had a great time. 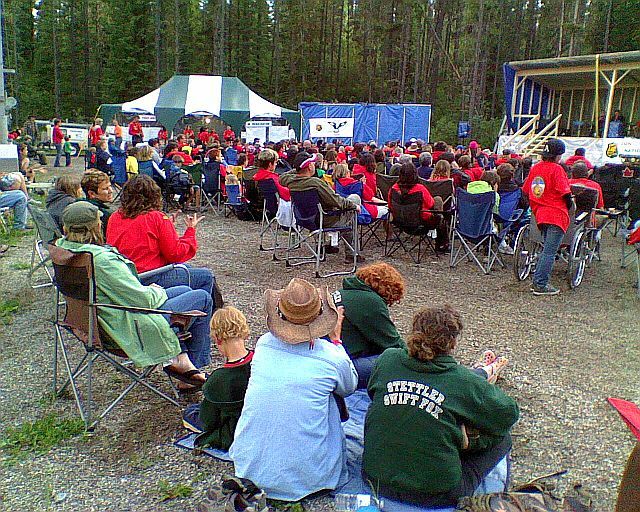 Some of the moments of the opening ceremonies to the 2011 National camp. Hereare a list of other sessions that were going on all over camp for theweek. 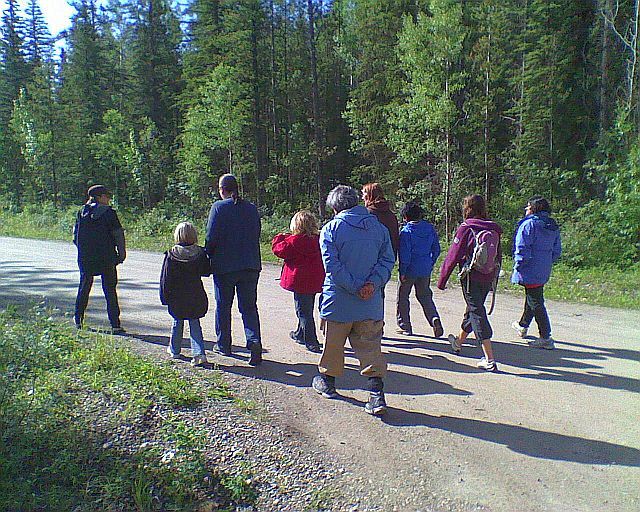 A day in the life of a squirrel, Advanced geocaching, AdventureOrienteering, Air Rifles, Archery & It's History, and Atlatls &Throwing Sticks with Alberta Parks. Also going on were, Backcountrytrip planning & equipment, Bark Book Making, Basic Map &Compass skills. We are not done yet, Beading, Bear Awareness &Avoidance, Bear tracking, Beginner Canoe Camping, and FlatwaterCanoeing. We have to keep going now, here are more. Black PowderChairs, Blacksmithing, Blow Darts, Bugology, Bush Bucksaw, BushcraftKnives, Campfire cooking. Nope we are not done yet here are more.Capote Making, Card Weaving, Carving tool sharpening, Chainsawsafety. Let's keep going, Combustibles, Crochet, Crossbows, TreeIdentification. OK OK you get the point eh the list just keeps goingand going and going. There are tons of cool things for everyone. 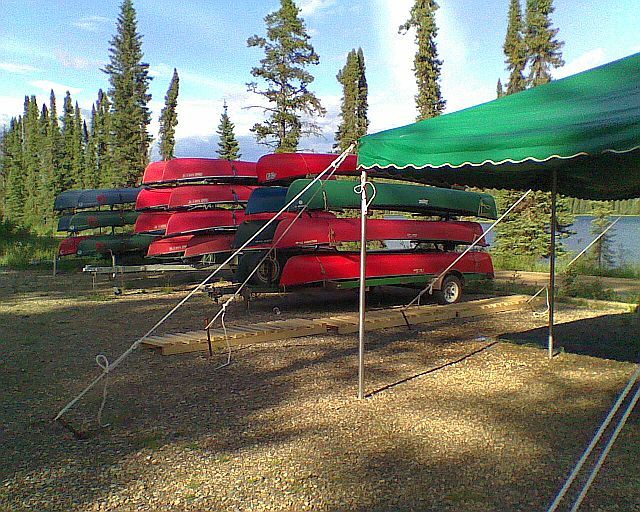 Canoes ready to hit the lake for a week of fun. YesI did, I talked up the advantages of having the WFN as a regular partof a fisherman's lifestyle, and told everyone to tune in.DEMAND WFN I said. I had questions a plenty about the WFN hat I woreall week. I had to represent the Ambassadors out there and we got itdone. And hey we might add to the Ambassador ranks as we get morepeople hooked on fishing. This time out we used the basic principlesof the F.I.S.H program and instead of a bunch of paperwork anddiscussion we were far more hands on and conversational. We freedourselves up to be more personal An approach I thought would help allto learn more effectively the programs we were there to instruct. Icould go over to a person answer their question and have a much morepersonal impact. Well it paid off big and on day one as we had alittle girl who stood out as a pure Natural to the sport of fishing.This little girl was used to her Dad and brother going fishing, andshe herself had no gear and up until that day had not cast a lurebefore. She picked our Pike & Walleye on Spinnerbaits course forsome reason. There had to be that inner fishing bug I speak ofsometimes that drew her to our program. I know if we had of done theprogram the old way we did before this little girl would have lostinterest. Instead she was engaged in the conversations, and when wegot down to the lake for the fishing part of the program I showed herone time how to cast a lure. She was casting farther than all of theboys and adults there that morning, the kid has real skill and dideverything to her best, great attitude to go with and confidence. First session on Monday, Pike & Walleye on Spinnerbait. More of the first session, just before we got going. The first session on the dock fishing, Rebecca is on the other side of Laura casting. She,Rebecca made an impact on Laura and I both, and at one point Lauralooks over at me and says "Gary" and pointed to Rebecca. Myanswer was an immediate "Absolutely" You all will rememberthe Rod and Reel I recovered from the bottom of Baptiste lake! Wellit was my plan to restore that rod and reel and give it away at thecampout, however time did not permit me to get that outfit fullyrestored. So Laura and I bought a similar model and had decided wewere giving it away and the collection of lost lures we haverecovered over the last several seasons of fishing. Rebecca soimpressed Laura and I we gave it to her and the lost lures. We madeit clear to everyone there, that a lure someone has the misfortune oflosing is not a lucky thing to the person who finds it. The only wayto restore the luck is to give it away to someone worthy. The lureswe find that have been lost do not belong to us, an angler lost it inan unlucky turn of events. It's not ours, and we maynever know who it belongs to, but hey, here is what is right. Rebeccahad no gear to start that day, now she has her own rod and reel, and a small set of lures to get her started. 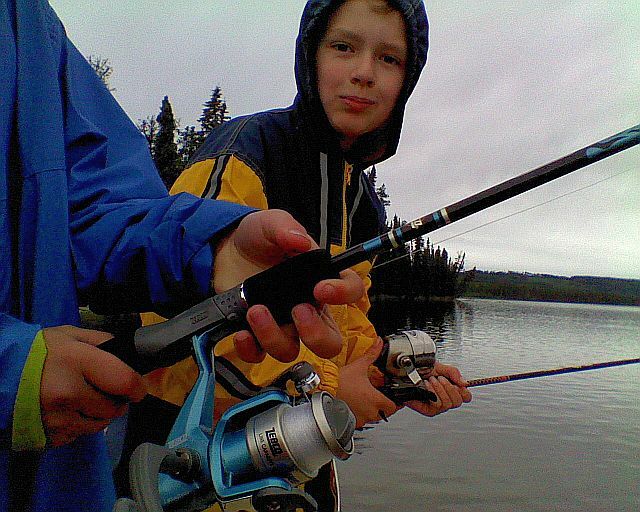 Now the lost lures havepurpose and luck restored for this young angler. All in that sessionunderstood the passion and love of this sport Laura and I have, andit was clear from that point on we were doing this right as everyonehad a blast. For the rest of the week our hands on personal approachreally paid off for the kids and adults there to learn fishing tipsand basics. 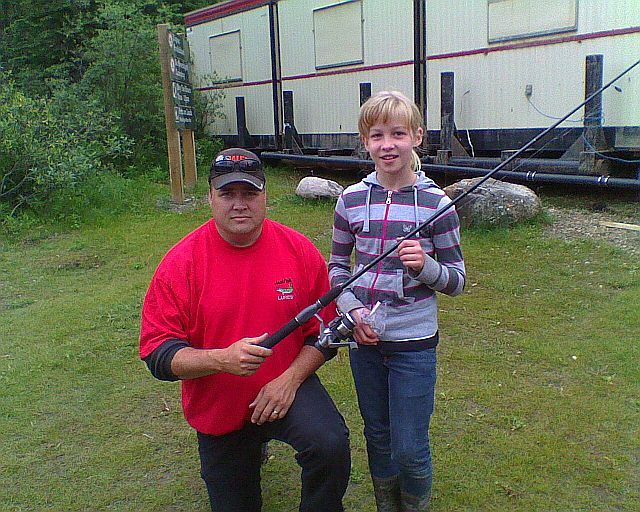 Here is a shot of Rebecca and her new rod & reel, what a wonderful kid. Thefly fishing program was amazing and one where I had an opportunitydropped into my lap by one woman who arrived at our session with anold fly rod and reel that had sat in the dusty garage for more than30 years! You can't write this stuff or make it up the outfit wasseriously old. She was concerned it would not work and she would notbe able to cast it. I saw the chance immediately and with nohesitation I told her it would work and that she would cast it justfine. She laughed and looked at me like I was kind of crazy. Severalof the men looked at me kind of funny like, and some asked if it waspossible for that old thing to work. I said to them we will make thisoutfit work you will see, I had them all hooked for the rest of theday. Gregg Lake, Laura, caught a Brown Trout out there on a spinnerbait we use for Pike! Cool Eh! 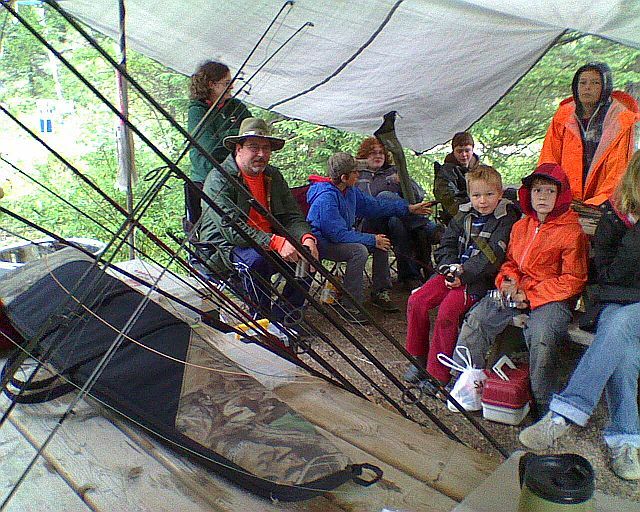 Sowe got started on the different types of fly fishing and differentgear and so forth, and how Balance is everything to make sure to pickand balance their gear properly for the individual. Then we came tothe maintenance of the fly lines. I took the old 30 year old dustyoutfit and showed the whole group how to clean and stretch the flyline. I know from my best friend "experience" the linecould have been 50 years old it did not matter if cleaned andstretched it would do it's job. We then took it down to the lake andafter some instruction the woman who brought the outfit to the lakewas smiling as she was fly casting with it. Now it took some time forher to get her mechanics down but she was doing it and with her 30year old outfit. There were guy's who were blown away with how thatworked, I heard a bunch of "I can't believe it's" but hey,gear is gear and if it's clean and not damaged gear does what geardoes. I told them all, the gear is a tool we impart the action to thetool and it don't matter if it's 30 years old or brand new if youknow how to use a tool you can make it work. All were blown away withthat example, and for me I was glad that old fly gear made it upthere for an example to use, what an awesome opportunity given to me.And I can assure you all, everyone in that session now has anunderstanding of how to use fly fishing equipment. 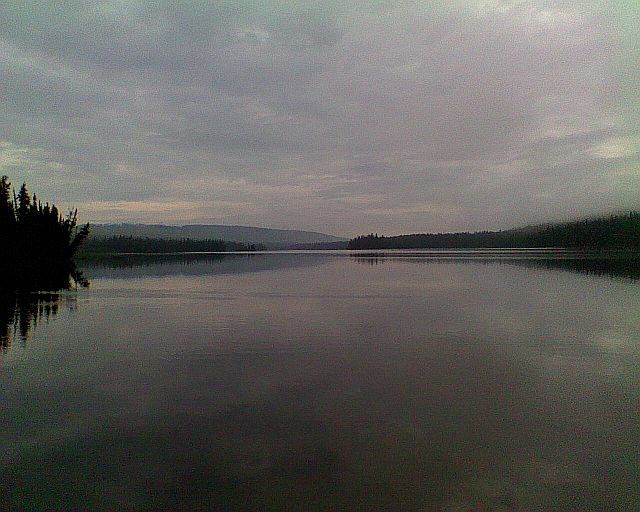 Gregg Lake has Pike, Walleye, Lake Whitefish, and Brown Trout. Ihad one girl who never fly cast before, again another like Rebecca, Itook some extra time to show her the mechanics of the casting andshowed her one time. This wonderful girl Chelsea, was flea flickingwith the best of them. Again on now day 3 of this event another totalnatural and by the end of the course she was making casts andperforming the Double Haul. I have spent hours and hours with otherstudents to get the double haul down. Chelsea was doing it inminutes, and had a perfect attitude and confidence about her thatrubbed off on all of the other folks at that session. I was impressedwith the quality of this individual and just amazed at how naturalshe picked up the sport. It's people like Chelsea who make up thecollection of folks at the events the JFW put on, classy, classy,classy, wonderful kid. 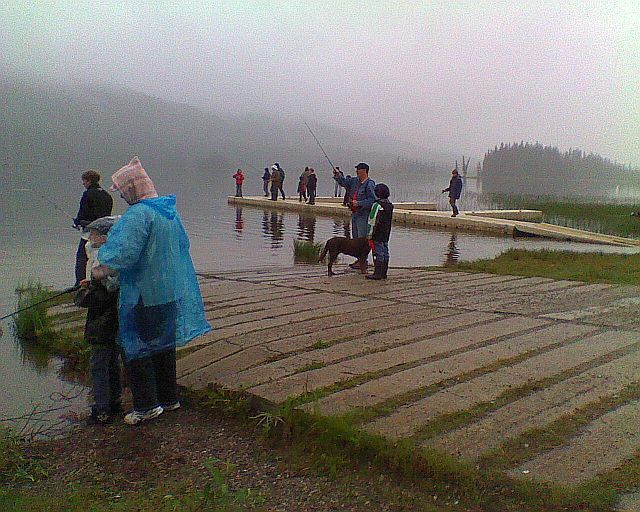 Another session of kids and parents out fishing despite the weather. Wehad fun with the fly tying session and several anglers were able topick up on how to spin deer hair and trim it into toads and poppers.Once again a little girl, stood out a real crafty smart kid whopicked up on the spinning very fast. I had her start with a wire wormwhich she tied in a few seconds and once I saw she was a quick studygot her spinning. Again showed her once the rest is history a purenatural, and with practice and a creative streak she will have funtying fly's for years to come. 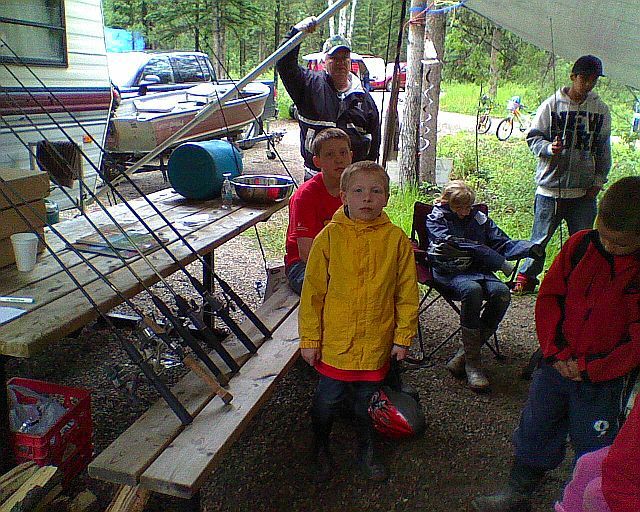 Her dad sitting next to her picked upon the spinning also they will have a blast I know it fly fishing.Another stand out all week was a kid named Bernard from RockyMountain House Alberta this kid was just plain smart. Quick study andLaura taught him how to make the Western Toad which he managed tomake one almost perfect, a great kid and he had to be because Lauradoes not show that pattern fly to just anyone. Laura and a group of anglers headed to the water front. Day4, was fun and again full of great sessions going on all around theentire camp, & canoes and kayaks all over the lake. Laura and Ihad a bit of a break as we just had the morning session and were freeto participate in the Trade show for instructors. They had a tableset up for us to display the Jackfish Lures products. So Laura and Iget set up and we are barely done when one of our fine students fromthe week Joann shows up and picks up a few lures and purchasedLaura's Western Toad Fly's which I had forgotten back at our camp. 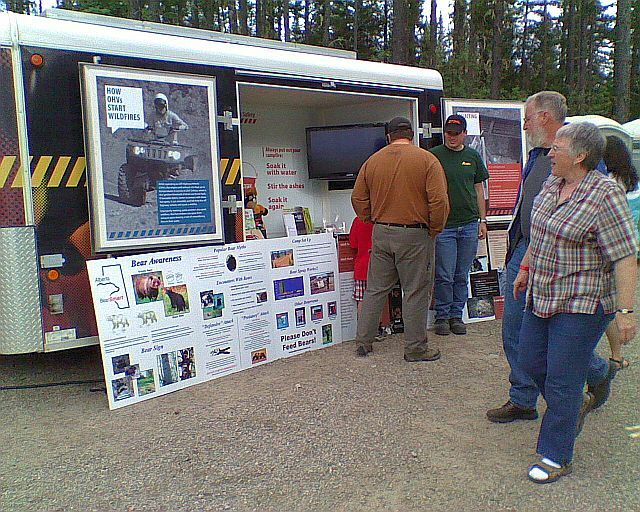 SoI jump in the truck head over get the fly's and by the time I gotback 20 minutes had gone by and we were sold out of product! I saidto Laura what happened? She starts laughing and says everything sold!I was astonished, and said to her WOW that was fast! Laura in hertypical way smiles and says all done! Chief Warden Terry Garrettcomes over and asked if another instructor, a late arrival couldshare the table with us they also had some wares to sell. I told herwe were all done sold out, we moved out and let the other folks in todo their selling. I could not believe the response we got, it showedthat people really cared about what we had to say and learned a lotfrom us, it felt good to say the least. 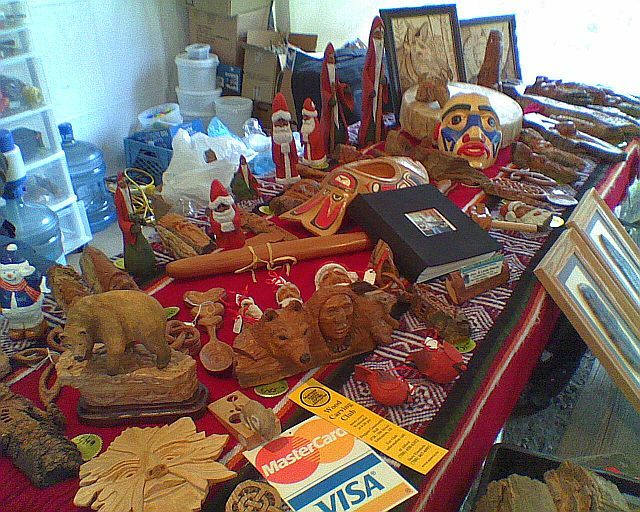 On the same day the silentAuction was going on, there were hundreds of items in there by thelooks of it. 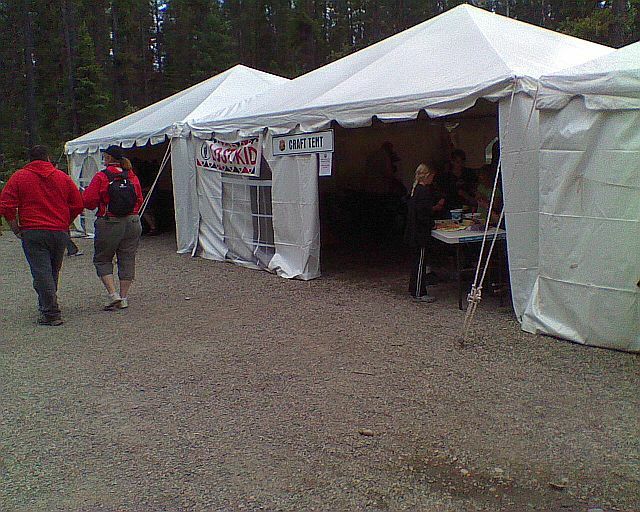 The tent was packed and they managed to raise over$10,000 it was a total success. 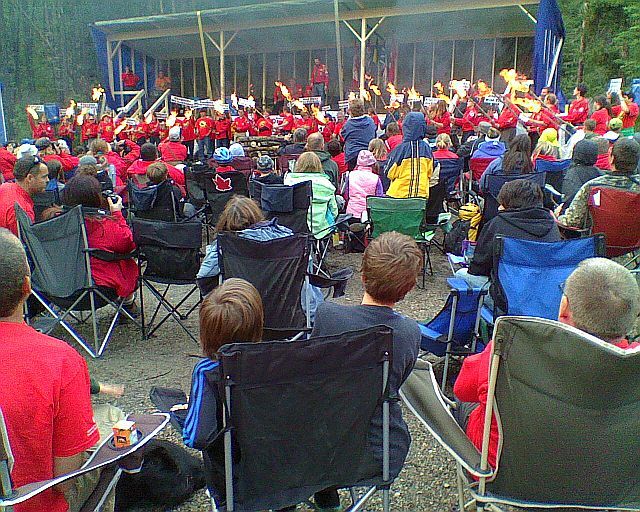 Remember now this event is way out inthe bush people camping for a week, over $10,000 raised for thesilent auction!! WOW Just amazing. Day 4 trade show silent auction day. Lot's of things going on at Camp Central. 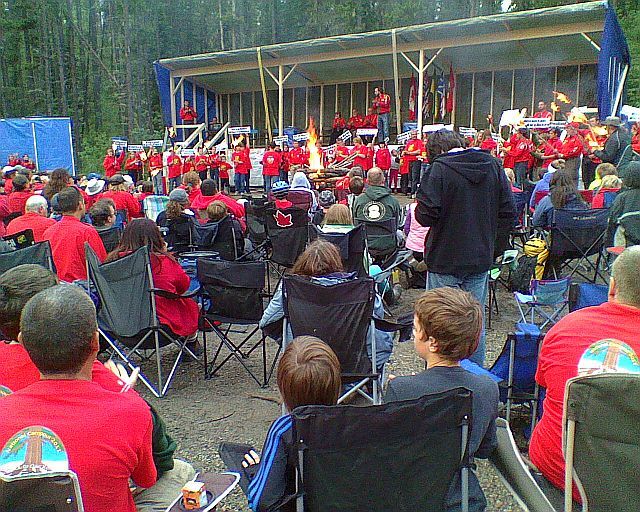 Camp Central was the gathering place all week, live bands and much more going on. ByFriday day 5 Laura and I are starting to hit a wall of tiredphysically, just about wiped out, and we managed to get up get readyand finished out the week. 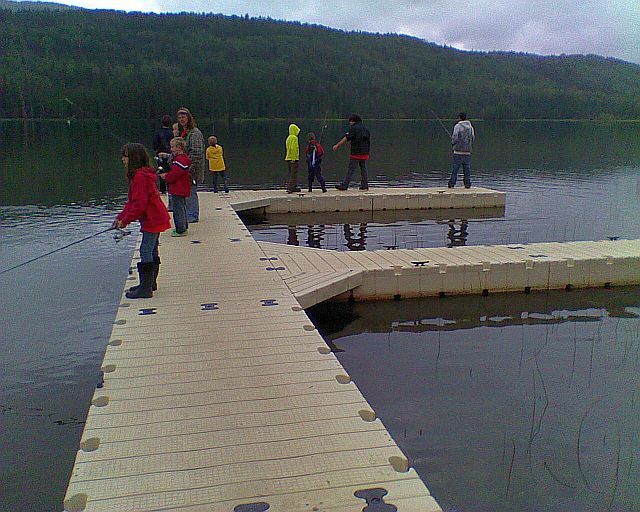 Our last session was on Fishing Gear andTackle boxes and we also took everyone down to the water front forfishing. The kids had a blast and we had several parents show up andthank us for the instruction they had received during the week and atnoon we were all done. I said to Laura where did the week go? 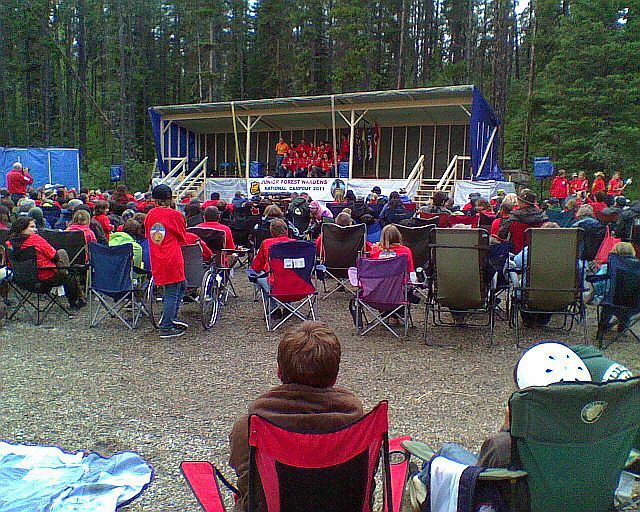 It wentby fast and before we knew it we were sitting at the closingceremonies. I was so tired that I did not want to get out of my chairthat afternoon, and if there had of been a T.V with WFN on I wouldnot have got up from that chair, I can tell you that. Friday morning just before we got started with our final session of the week. Friday Morning Fishing, gotta love it. 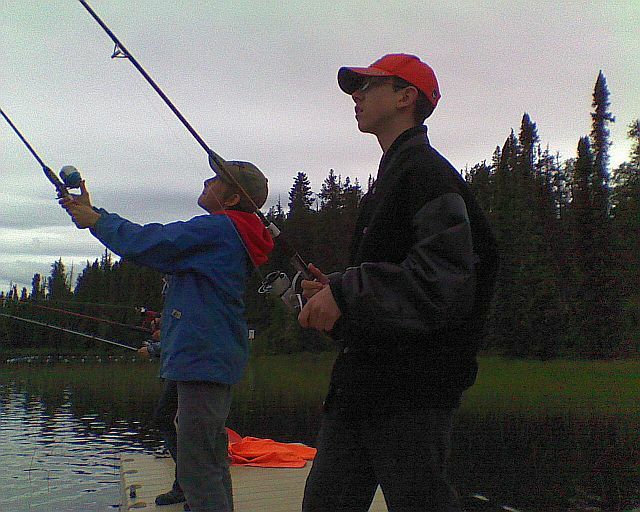 Kid's having fun fishing, what a great week. Up behind Al on stage is the amazing tile board the kids painted during the week. 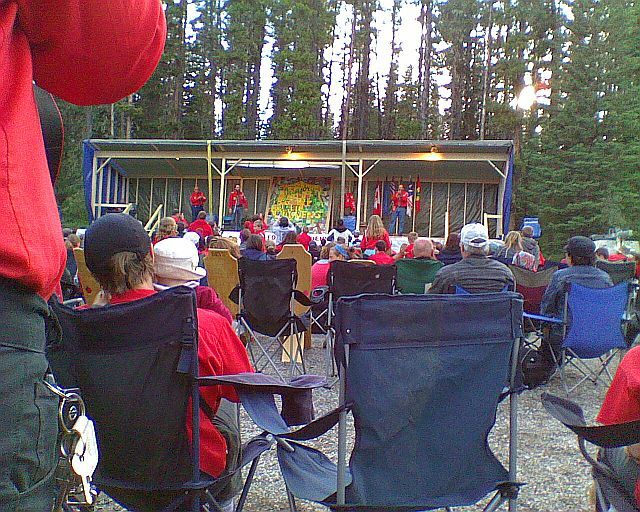 Theclosing ceremonies were just as cool as the opening however a littlesad for lot's as camp was now over. During the week the kids from allover the camp had been painting individual tiles for a tile board andduring the closing they unveiled the tile board it turned out to bequite the art work a real cool representation of the week, whichmanaged to come out looking like the Junior Forest Warden logo.Classy, Honest, fun, these are words which describe the Junior ForestWarden program and it's people. 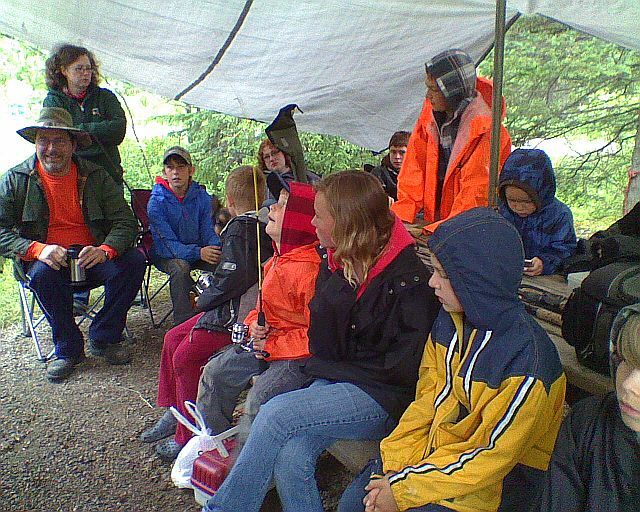 If you have been looking for anassociation to join the Junior Forest Warden program is by far thebest I have seen for letting the parents share with the kids, allparticipate together. 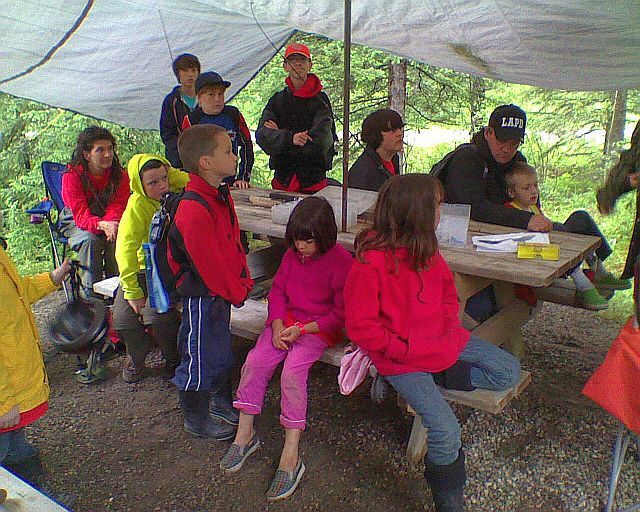 If you don't have a Junior forest Warden inyour area start one, it's easy to do go here to www.jfwa.ca all theinfo you will need to start your club is there. Laura and I andJackfish Lures are honored to have been part of this amazing eventand look forward to the next one. Hey I sure hope to see you there.